I don’t know how else to say this, but these Peanut Butter Pretzel Cookies are the best peanut butter chocolate chip cookies. I love the old standard too, but these chewy cookies are pretty much peanut butter pretzels transformed into cookie form – and that’s pretty hard not to love. No doubt, my family will disagree with this. My dad in particular. Peanut butter cookies are his favorite, and every year around the holidays, we make the classic version – you know it: brown sugar, an incredible amount of peanut butter, butter, and vanilla. Oh and maybe a little flour to hold the whole thing together. Then, roll into balls, and give each the trademark hashmark with a fork. This recipe is here to crush that recipe. Sorry, dad. But, these peanut butter pretzel cookies, built on the bones of the indefatigable Jacques Torres Chocolate Chip Cookie recipe that the New York Times published in 2008, has won my heart, and I’m not going back. 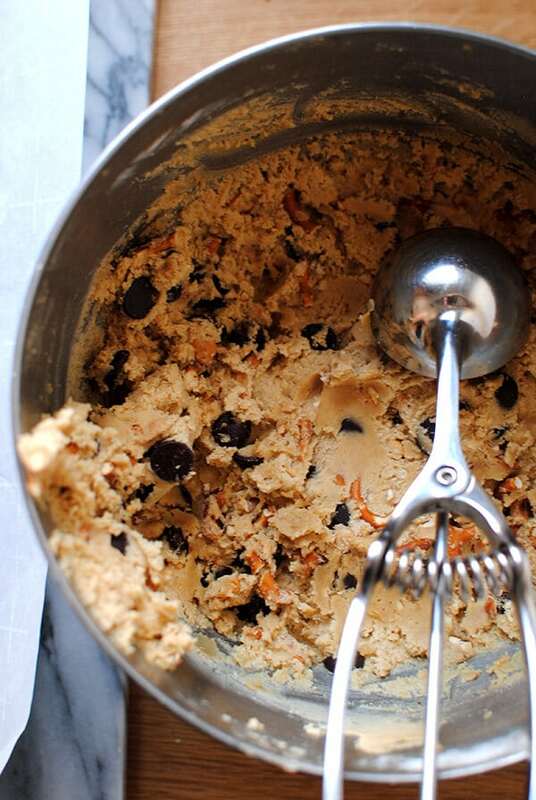 Making the ultimate peanut butter chocolate chip cookie all started with curiosity. I kept seeing a recipe for Peanut Butter Pretzel Cookies. Or, cookies, that as my friend put it that are “everything you want to put in your mouth at once.” Well, alrighty then. I made them, and they were good but I wanted them to have even more peanut butter flavor. Could I find a way to get more flavor into the dough so in each bite you got the crunchiness of the pretzel and the flavors of salt, chocolate, butter, and peanut butter? Could I create a cookie that you couldn’t stop eating after just one? A cookie you had to take to unsuspecting coworkers at work or to a friend’s house because you couldn’t be trusted to not eat all of them if they remained in the house? I returned to the original recipe and began fiddling with some of the ratios. I swapped out half the flour for bread flour, added baking powder as an extra leavening agent, and added crunchy peanut butter. I never use crunchy peanut butter when I bake. I was also apparently living under a rock because that stuff is goooooooood. Yes. Actually. I was. Hurumph. So, back to testing. I turned to Jaques Torres for help. Could the Jaques Torres Chocolate Chip Cookie recipe be altered to create the best peanut butter cookie ever? Could it be done without destroying what makes the original recipe so incredible? The Jacques Torres recipe is fancy. It doesn’t use all purpose flour. 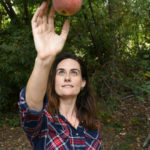 It uses a mix of cake flour and bread flour, both of which have a different amount of gluten protein than all-purpose (AP) flour. (Cake flour has 8-10%, All purpose flour has 10-12%, and bread flour has 14-16%). 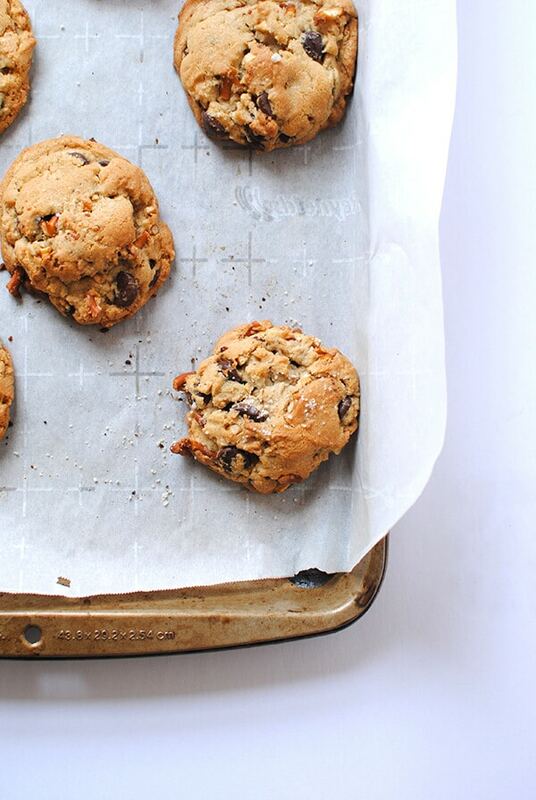 By combining the two, you end up with a light, chewy cookie. To this genius recipe, I added crunchy peanut butter (my new fave), half a cup of 53% cacao chocolate chips, and a stupid amount of pretzels. I went a little pretzel crazy… I just kept adding them to the mixer. I think I ended up putting two and a half cups in. Maybe three. And then, I put it in the fridge for 24 hours. I topped it with a little salt before baking and when I tried it… boom. Yes. This. At this point, I had eaten too many peanut butter pretzel cookies to have an unbiased opinion. So when I met up with a friend to watch the sequel to Trainspotting, I brought three freshly-baked cookies, one from each batch. In my bag. To the theatre. I’m that person. During the film, I snuck him one at a time, not telling him which was which. After he had tried all three, I leaned over and whispered, “So?” He held up what was left of the Jacques Torres peanut butter cookie. Huzzah. The next morning, I baked what remained of batch #2 and the Jacques Torres-inspired Peanut Butter Pretzel Cookies and brought them to my coworkers. By early afternoon, no Jacques Torres cookies were left. Give them a go and let me know what you think! Just be very very mindful not to overbake them. Overbake them and you’ve got gummy pretzels. And no one wants that. * Cream the butter and sugar for at least 3 minutes. * Use more baking powder for chewier cookies. For crispier cookies, use less. * Let the dough rest in the fridge for at least 1 hour, preferably 24. * Don’t overbake. Cookies will continue to bake on the baking sheet after you remove them from the oven. What are your tips for the baking best cookies? Tell me in the comments! 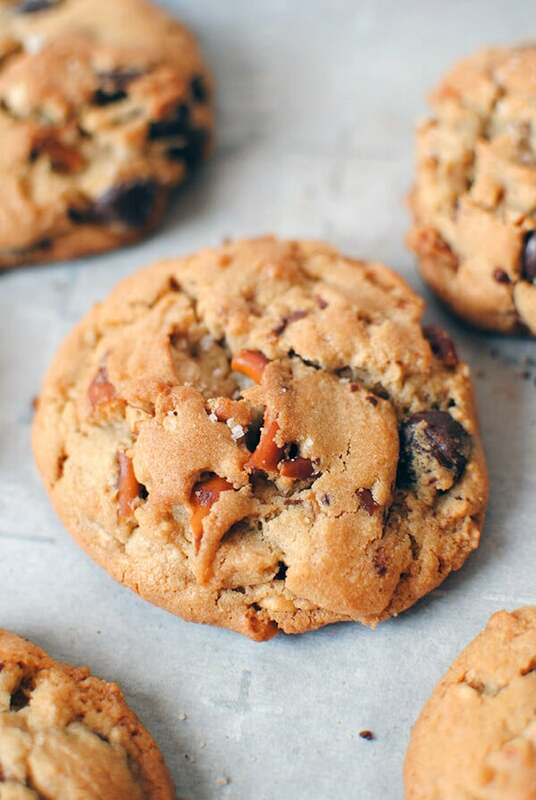 These Peanut Butter Pretzel Cookies inspired by Jacques Torres's New York Times' recipe combine peanut butter, pretzels, and chocolate chips all in one cookie! Whisk flours, baking soda, baking powder, and salt in large bowl until combined. Cream butter, sugar, and brown sugar in stand mixer for 3 minutes on medium-high speed. Turn speed to medium. Add eggs, one at a time, mixing for 30 seconds before adding the second. Turn speed to low. Slowly add flour mixture. Turn off mixer. Cover bowl with plastic wrap and place in fridge for 24 hours. Preheat oven to 350°F and remove cookies from fridge. 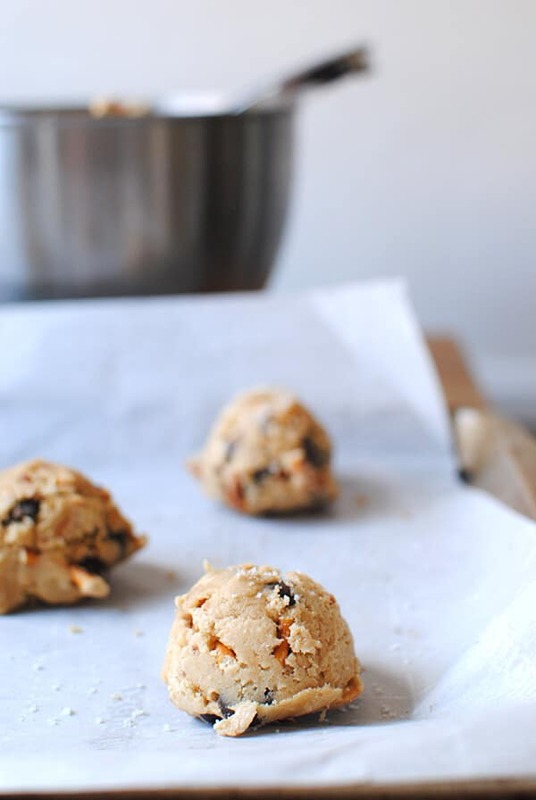 Use #16 ice cream scoop to portion out cookies onto parchment-lined baking sheet. Top each with a small pinch of flaky sea salt. Bake for 10-12 minutes until edges are just golden. Add a few pretzels on top just before the end of the baking process. Be careful to not overbake. Let cool for 3 minutes on baking sheet then move to cooling rack. I love how fun these cookies are! 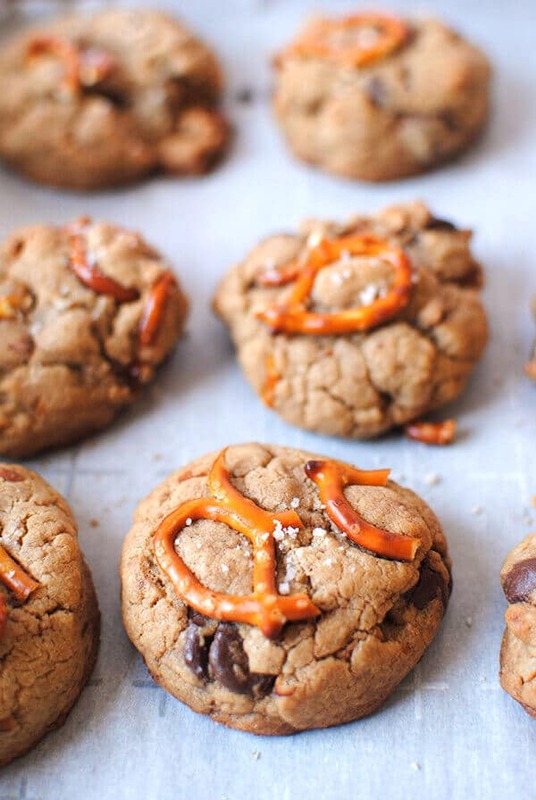 Pretzels inside peanut butter cookies!!! OMG! The week before Easter is not a good time to be on a no carb diet. These look amazing, but you are absolutely killing me! 😉 I know how it goes! Maybe these could be good for Easter brunch? I’ve never had pretzels in a cookie before. But I’m all about the sweet and salty flavour combo, so I bet I’d love these! I can’t believe you went to so much effort to find the perfect cookie. I totally admire you and wish I had your dedication! 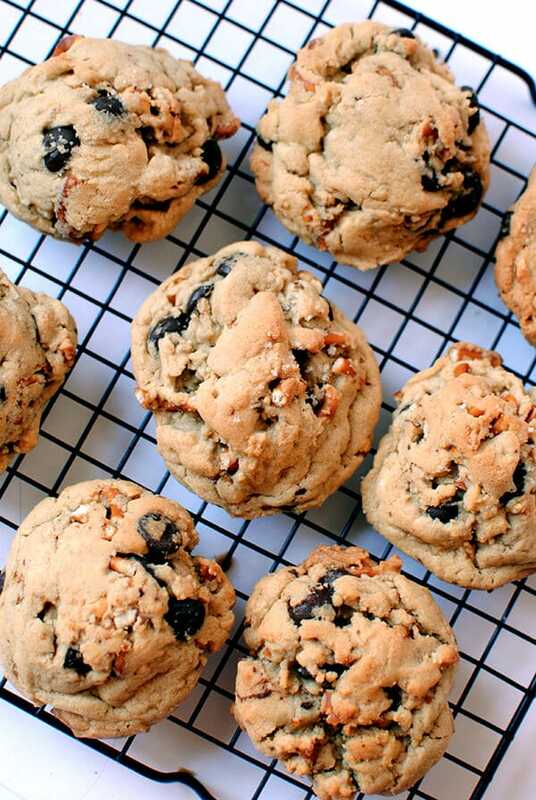 These definitely do look like the best cookies ever ever ever, so congrats to you! Thank you! I’m a bit of a tinkerer when it comes to recipes. Let me know what you think if you make them! What a BRILLIANT idea to add in the pretzels to that JT chocolate chip recipe! I simply love the sweet and salty combo of the two – and these cookies sure look and sound swoonworthy! Wow! Pretzel in a cookie-genius. These cookies look amazing, totally worth all your hard work. Thanks for the tips, I wish I was one of your co-workers. Thank you! They were really fun to make. It’s a good and bad spot to be in. They get to eat most of the treats I make, but I bring in treats pretty often! Oh! Thank you – I’ve updated the recipe. 2 eggs. MMM sounds Delicious. Love the salty combo. Can’t wait to taste ! They are the best I’ve eaten. Thank you! I appreciate your kind words. I bet these would be equally yummy with almond butter or cashew butter, though I haven’t tested those versions. I just mixed these up and I’m baking them off tomorrow. I totally went with AP flour because I rarely use cake flour and I couldn’t see buying it just for this. If they come out tough, I will only blame myself. I also used natural chunky peanut butter because it was what I have. I’m super excited to try these. They look deliciously dangerous. I’m planning on bringing them to work because I suspect I will be tempted to eat all of them. Also, as an aside, I have a bag of mini peanut butter cups and don’t think I wasn’t tempted to substitute them for the peanut butter and chips. I do actually have more butter and eggs….. hmmmm..
I’m actually on a social media break right now but I totally just posted pictures on insta anyway. These are delicious! Thank you again for the recipe!